Christopher Hogwood is definitely a pig with personality! He’s bright, curious, and has just a slight infatuation with rich, inviting mud. 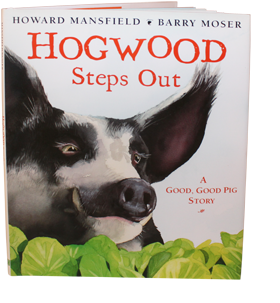 Hogwood Steps Out is Howard Mansfield’’s fictionalized account of his own pig’s behavior on a fine spring day, a pig made famous in his wife Sy Montgomery’s book, The Good Good Pig. Barry Moser’s luminescent paintings give Hogwood a personality that is all his own, allowing him to remind us to notice all the little wonderful things that surround us every day.